* ... ARE YOU HAPPY? 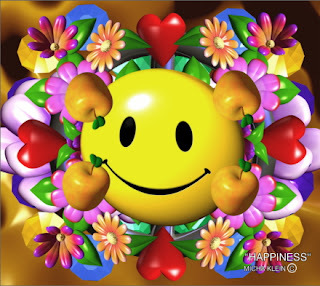 : Interesting read in The Wall Street Journal on some important research into happiness. New evidence "suggests that people who focus on living with a sense of purpose as they age are more likely to remain cognitively intact, have better mental health and even live longer than people who focus on achieving feelings of happiness." It went on to warn that "in some cases, too much focus on feeling happy can actually lead to feeling less happy." In other words, focus less on the next gourmet meal or winning the NCAA basketball pool - those are examples of "moments" of short-term happiness that are fleeting - and more on volunteering, being involved in community projects, raising children or improving yourself. "Striving to live a meaningful life or to do good work should bring feelings of happiness... But people who primarily seek extrinsic rewards, such as money or status, often aren't as happy." * ... YOUNG WICK: Local jeweler Gordon Wickersham wrote to tell me about his son, Bakersfield High graduate Alex, who is featured in a story in Popular Mechanics magazine. Alex works for Joby Energy, a start up company in Santa Cruz that is working on an experimental wind turbine that flies like a kite and sends its electricity to a grid on the ground. Apparently the airborne turbines are lower in cost and higher in yield than the traditional land based wind turbines. * ... DUTCH HOLLOWAY: Local historian and retired teacher Gilbert Gia said recent posts about the old La Cresta Air Park "helped me locate Dutch Holloway's Airfield, which in the early 1920s was near today's Green Frog Market on Bernard. Dutch was offering round trip flights to Los Angeles in 1922 even before there was a Meadows Field." * ... LIONS: And speaking of Gilbert Gia, a reader turned me on to one of Gia's historical research papers about the enormous lions that once stood in front of the old Kern County jail. The lions stood for 47 years until the 1952 earthquake, which damaged the jail building beyond repair. 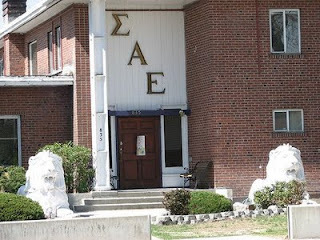 The lions were salvaged and were later purchased by Clyde Biglieri, a Sigma Alpha Epsilon alumnus from the University of Nevada at Reno. Lions are the national fraternity's symbol so Biglieri and some other alums ponied up the money to buy and move the statues to Reno. Apparently they were damaged along the way, but were restored by a fraternity brother and now stand guard at the fraternity house at 835 Evans Street. * ... DRIVE-INS: Paul Summers is the latest reader to weigh in on the drive-in restaurants that once were so popular in our community. "If my memory serves me right, before Michener's Drive-In it was Boo's Drive-In, owned by Walter (Bo) Boylan, older brother of Jim Boylan. At that time, they served the best sandwiches in town." As for Michener's, reader and friend John Brock remembers that Michener's stood at the northwest corner of 18th and Q streets. "The drive-in consisted of a big parking lot in front of a small building at the rear of the property on the south side of the alley between 18th and 19th. I remember that getting into and out of the lot was sometimes a chore as cars pulled into the lot in parallel lanes perpendicular to the building and were served in the order in which they arrived. The cars closest to the building would have to leave and then all the cars behind would move up in line. Sometimes you might finish before the car in front of you and would have to wait for them to leave. I remember more than a few instances where a drink or something left on one of the trays they attached to your car would fall off when you were moving up in the line to make room for customers trying to get into one of the lanes. I also remember that the carhops who took your orders were not allowed to write anything down, they would have to memorize the order and submit it to the kitchen."